Crumbles are a true British dessert, which can be made any time of the year using seasonal fruit. Crumbles are the most comforting of comfort foods, with crisp, textured crumb contrasting with a warming layer of stewed fruit and spices. They are believed to have originated around World War 2, when the rationing of butter, sugar and flour made pastry-based desserts a luxury. Typically, crumbles use soft fruit like apples, pears, rhubarb or plums, but berries also make a good addition Dominic Chapman's gooseberry crumble, or Adam Gray's comforting blackberry and apple crumble. Paul Ainsworth's orange marmalade cheesecake recipe comes with an Amaretti crumble topping - a fantastic summery alternative to a hot crumble. 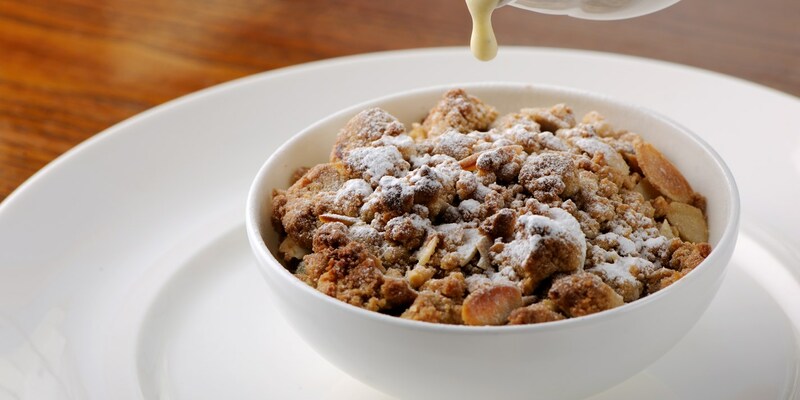 A crumble topping can also work for savoury dishes, such as in Marcus Wareing's leek crumble.